For decades, the method of public sector governance in Bermuda has not experienced much change. In fact, until the OBA Government’s establishment of the SAGE Commission in 2013, public service studies had been conducted without any large-scale discussion or implementation. Yes, the service did evolve and changes were made during that period, however, the theoretical mind-set regarding governance remained the same. With the establishment of the SAGE Commission, the OBA Government ushered in a new way of thinking that was in alignment with other neo-liberal Governments throughout the world who have been moving full-steam ahead with public service management reforms. Establishing explicit standards and performance measures because accountability requires clear assignment of responsibility, not diffusion of power. Whether these changes are good or bad is cause for debate. While the former PLP Minister of Finance Paula Cox often called for the public service to `do more with less’, the OBA has transformed that catch phrase into a mission. We must ask ourselves, is the social contract between the Government and the citizens of Bermuda being redefined? Is the OBA seeking to create a market-friendly, liberalized, lean, decentralized Government State where business interests trump the social needs of the citizens? The theoretical view that the Government is at the service of the people, and, that consensus in a democracy is supreme seems to be no longer the case. The Government’s business agenda is clear; they have introduced and amended business-related bills at a rapid rate. However, the Government has failed to live up to its promise to harmonize and modernize the disjointed and antiquated labour legislation that governs industrial relations in Bermuda. The title of Janet Jackson’s 1986 hit song ‘What Have You Done for Me Lately’ is the question that the average person in Bermuda wants answered. However, it is a foolish question as the citizenry of Bermuda should already be clear how they have or have not benefited from the Government’s policies. The public should also be clear that the neo-liberal mind-set and the new approach to public service management is to support business and that the benefits of business development will trickle down translating into jobs and capital into the economy. The practice of cutting jobs in the public sector while facilitating jobs creation in the private sector seems to be a formula that is falling short of its desired result. Bermudians continue to lose jobs and job creation has not been at a satisfactory rate in years. The OBA Government has done what I consider to be a satisfactory job in stabilizing the economy. However, the socio-economic conditions of the people in this country are deteriorating. The management of the country has been lopsided in favour of business but that’s the way the OBA Government want it. Efficiency is the order of the day. However, efficiency at what cost? 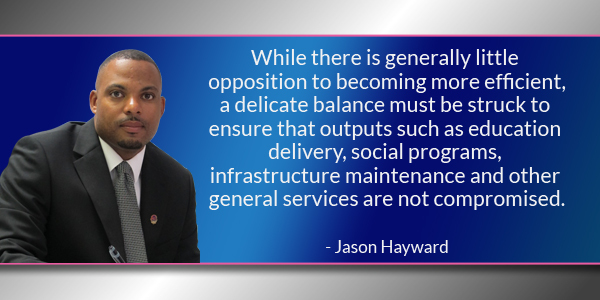 While there is generally little opposition to becoming more efficient, a delicate balance must be struck to ensure that outputs such as education delivery, social programs, infrastructure maintenance and other general services are not compromised. These union presidents get paid well to rile their following. How about they provide the financial satements for their unions so the members can see where their money goes instead of getting into politics? Would be nice if they focused on their job, and did not abuse their positions by acting as activists and propaganda agents of a political group. Because if their members really knew where the money went there wouldn’t be any more members lmfao! And let’s not forget that your beloved PLP created the problem and had no idea how to get Bermuda out of the economic death spiral they put us in. No matter what party inherits the economy next election they will face the same issues. To date, the PLP has not convinced me that they would be better stewards of the economy than the OBA. At the end of the day, money does not grow on trees! Yup. And u only hate on it because you “know” that its gonna generate a boat load of money for us. (pun intended). Unlike the group he supposedly stands for which do nothing but take from us. Truth always hurts. Ya just jealous d plp didnt think of it first. And we all need to figure out how to make $$$ off America’s Cup. Sad thing is that it, much like many other things, is prescribed for a particular group and oncertified the commoners are enlightened, the big ticket items are often spoken for ,leaving crumbs for the remainder to squabble over. One would wonder why , through the oba/U.B.P., charges were laid down against Mr. Hayward. Everyone should know it was because the man is extremely bright, capable, a no-nonsense man, BLACK, gifted and a male.Also, a massive threat to you know who. Hats off to you, Mr. Hayward. May your guiding light shine very brightly over all of us as we move towards the next general election, here in Bermuda!! You make me laugh! That’s exactly right….suuuuuuuuuuure! Black intelegent men that spoke up for de people and against white supremist ideology have always paid de price, America is a good example. Oh stuff it. You have zero clue oj. He dont like the way things are moving because it means the public sector is actually going to have to “work” now. U know, that evil four letter word the 80% of them dont want to hear. But as usual its the “evil white man tryin to hold a brother down.” Smh. This island is chock full of stupid. As you can become The President? He will be front and centre and the next “rally” shouting and screaming at the OBA ! Always thinking the worst for/ about Bermudians. White people ALWAYS speak negative against Black Leadership. Im sorry, but this textbook socialist/big government nonsense that Hayward continues to preach is only meant to attempt to fool the uninformed and set the stage for the continued economic marginalization of the average Bermudian. Meanwhile, Hayward and others like him continue to live off of the productivity of the average man through high, non-productive salaries paid for by their respective memberships. Those of us who understand REAL ECONOMICS recognize this intellectual nonsense for what it is, the self-serving art of the non-producing economic parasite! Fact is that neither Hayward, Furbert, or Tweed have never created one dollar of wealth in their adult lives. Real economics is all about the production of wealth, not the redistribution of wealth! And for the record, the policies of the current Government and the former Government are just as poor. …and your beloved oba/U.B.P. are all unfit as politicians…. What a hollow argument . I can tell the truth hurts . Why is that backbone? And tell the truth. Dont fluff it up. Just say what u mean. You say that about the party that created the original economic environment that provided jobs for all Bwrmudians and then ended our worst economic recession and have stimulated our economy back to a direction that may once again regain that former status. So what do you have to say about your party that created the economic environment that lead to the accelerated job losses, crippling government debt load, and a tarnished global reputation that we are still clawing back from that the current government is just managing to recover us from? The same party that have promised to return to those same failed policies and ideology if elected again. All talk and no solutions. And let’s not forget that your beloved oba /upb created the racial problem and had no idea how to get Bermuda out of the black/white death spiral they put us in. No matter what party inherits the economy next election they will face the same issues. To date, the oba/ubp has not convinced me that they would be better stewards of the economy than the plp . At the end of the day, the disparity between the races continue. It takes 2 peoples to create a racial problem and the PLP put us in this death spiral. taking money out of the pension fund. In all fairness, neither did your beloved PLP know how to solve race relations… Might as well stick to the party who is actually making a positive difference in everyone’s lives. Seems simple to me. They never tried. It’s suits the PLP agenda to have a poorly educated black majority. Applying private-sector-style management practices to increase flexibility in decision-making; This Government with their Leaders IE cabinet Office and PS level persons are not about to change a thing. If you go along with the program and do very little you are ok . If you run to higher up and pull down the ones that do work , If you go about making changes and be seen to making changes the whistle gets blown on you and you become the target. Sounds good but the Cabinet secretary is in a position to make a diff and it will never happen.. Just speaking from experience.